Share the post "Jaguar F-TYPE Project 7 : racing performance vehicle to tribute seven victories at Le Mans"
F-TYPE Project 7 is the first Jaguar performance vehicle from Jaguar Land Rover’s Special Operations team, and will be produced in an exclusive, limited-edition run of up to 250 units. Its distinctive roadster body, introduced in concept form last summer, pays tribute to one of the most famous and iconic racing Jaguars: the three-time Le Mans winning D-type, which in 2014 is celebrating its 60th anniversary year. 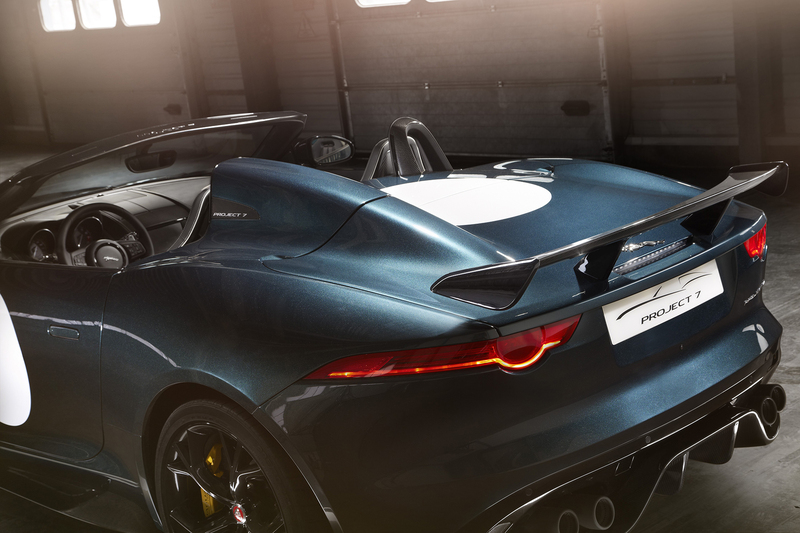 F-TYPE Project 7’s name pays homage to Jaguar’s seven outright Le Mans wins. Whitley, Coventry – 25 June 2014. 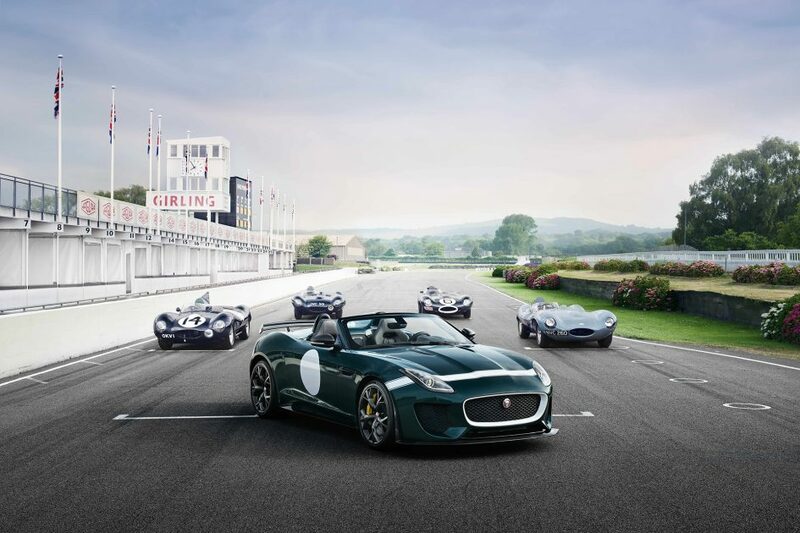 F-TYPE Project 7, the latest model in Jaguar’s acclaimed F-TYPE sports car range, is set to make its debut at the 2014 Goodwood Festival of Speed on 26 June. The 2014 Jaguar F-TYPE Project 7 is not only the most focused derivative of the award-winning F-TYPE range, but is also the fastest and most powerful production Jaguar ever built. 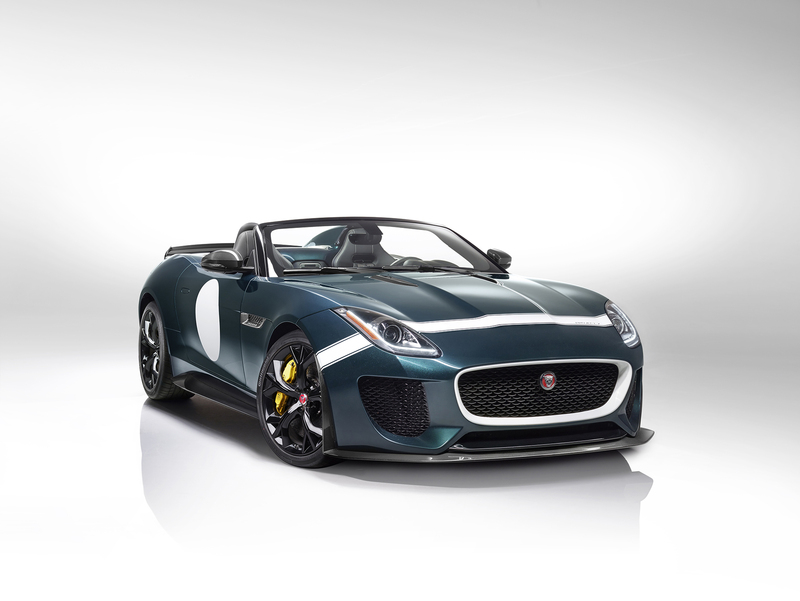 F-TYPE Project 7’s power comes from Jaguar’s 5.0-litre supercharged V8 engine, now in 575PS/680Nm form, enabling the all-aluminium-bodied car – which weighs 1585kg – to achieveacceleration from 0-60mph in 3.8-seconds (0-100km/h in 3.9-seconds) and an electronically-limited top speed of 186mph (300km/h). F-TYPE Project 7 is fully road-legal, with a removable roof and 196-litre stowage space. Power is sent to the rear wheels through Jaguar’s eight-speed Quickshift transmission and second generation Electronic Active Differential (EAD). Carbon Ceramic Matrix (CCM) brakes, available as an option on the F-TYPE R Coupé, are fitted as standard on F-TYPE Project 7, offering powerful, consistent, fade-free braking. Another standard feature is Torque Vectoring by Braking (TVbB) which, working in conjunction with the EAD, enables extremely precise handling. Bespoke carbon-fibre aerodynamic aids and a unique suspension set-up enable F-TYPE Project 7 to deliver a truly engaging driving experience. 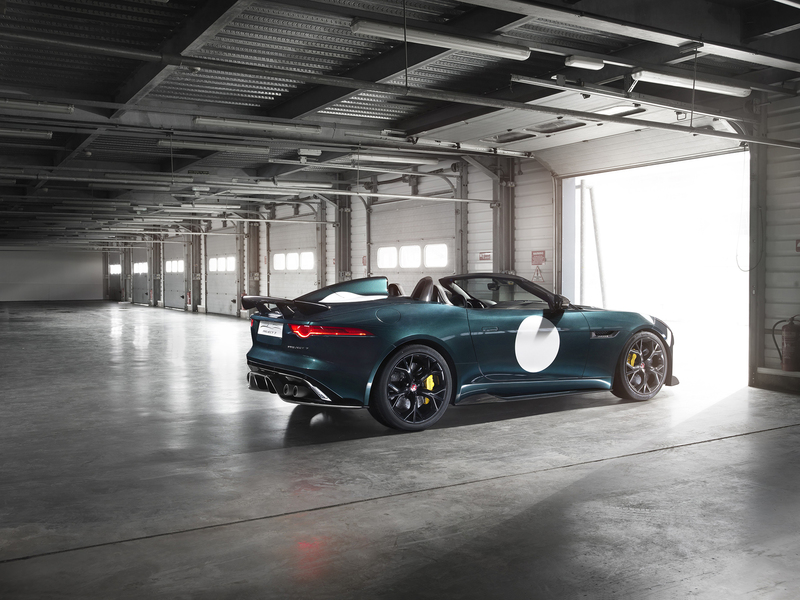 While F-TYPE Project 7 features performance-focused engineering by Special Vehicle Operations – the engineering and vehicle division of Special Operations – its design has been kept true to the head-turning lines of the original Project 7 concept, which was unveiled last summer. The 2014 Jaguar F-TYPE Project 7 is a product of pure passion, and the pinnacle of Jaguar’s performance sports car range. The most focused derivative of the highly acclaimed F-TYPE range, it is the fastest and most powerful production Jaguar ever made. The Special Vehicle Operations-engineered F-TYPE Project 7 is powered by Jaguar’s 5.0-litre supercharged V8 engine, as seen in the F-TYPE R Coupé, but in an even further enhanced form: it produces 575PS (an increase of 25PS over the F-TYPE R Coupé) and 680Nm of torque. 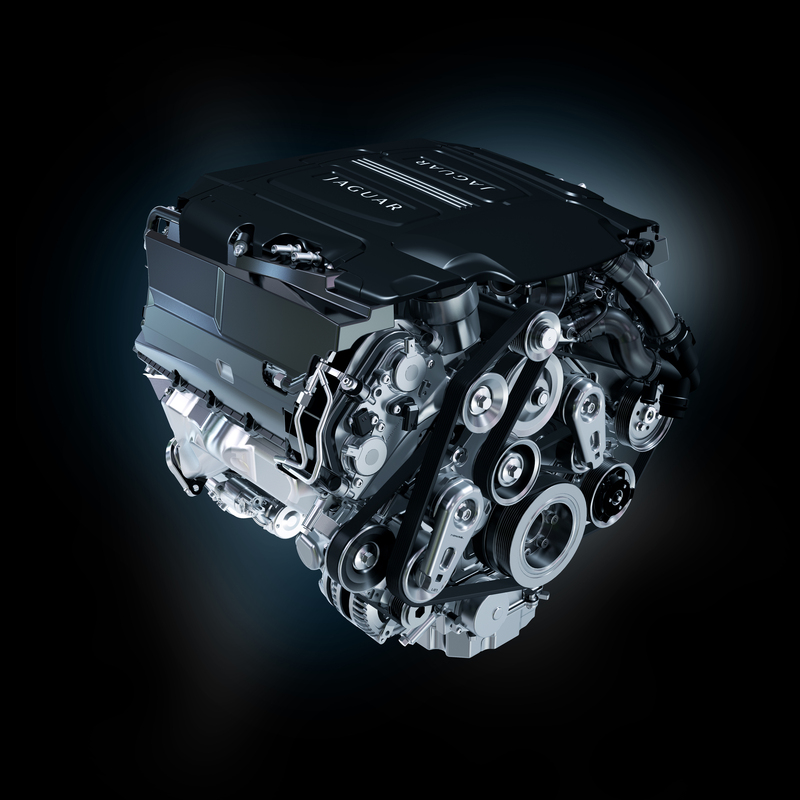 Power is delivered to the rear wheels through Jaguar’s eight-speed Quickshift transmission and second-generation Electronic Active Differential. Special Vehicle Operations engineers have developed a bespoke transmission calibration for the F-TYPE Project 7, with revised shift points and characteristics. This enables the lightweight, all-aluminium bodied roadster – which, at 1585kg, weighs 80kg less than the F-TYPE V8 S Convertible – to accelerate from 0-60mph in just 3.8 seconds (0-100 km/h in 3.9 seconds), with an electronically-limited top speed of 186mph. The increased performance, combined with the handling and aerodynamic enhancements, make F-TYPE Project 7 the new benchmark in high-performance Jaguars. F-TYPE Project 7 features a switchable Active Sports Exhaust system with quad, matt-black ceramic coated, outboard-mounted tailpipes. The system uses electronically-controlled bypass valves in the rear section of the exhaust which are mapped to open according to a range of parameters, effectively altering the exhaust gas routing into a free-flowing straight-through arrangement to both reduce back pressure and enhance sound quality. F-TYPE Project 7 rides on 20-inch Storm alloy wheels in gloss black, which customers can opt to have fitted with high-performance Continental ForceContact tyres. Carbon Ceramic Matrix (CCM) brakes – with 398mm front and 380mm rear discs allied to six- and four-piston monobloc calipers respectively – are fitted as standard. 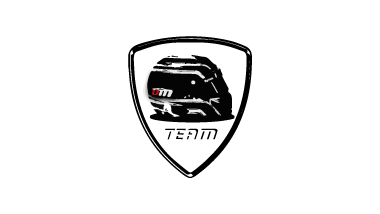 Made from a matrix of carbon-fibre and ceramic, which is extremely hard and highly resistant to wear, the CCM system offers consistent performance and excellent fade resistance even during sustained extreme driving conditions. Jaguar’s CCM brakes feature a pre-fill system function that applies a low brake pressure to all four calipers when the throttle is released – and before the brake pedal is pressed again – to ensure consistent brake pedal feel. F-TYPE Project 7 benefits from bespoke, Special Vehicle Operations-engineered front suspension knuckles which give increased negative camber, revised top mounts and new front/rear anti-roll bars. The front and rear spring and damper units are height adjustable, and both spring rates and damper internals have been tailored specifically to F-TYPE Project 7. Jaguar’s Adaptive Dynamics system actively controls vertical body movement, roll and pitch rates by continuously monitoring driver inputs and the attitude of the car on the road, adjusting damper rates accordingly up to 500 times a second to optimise stability. The Adaptive Dynamics controlling software has been precisely re-calibrated to suit F-TYPE Project 7, the Dynamic Stability Control system also having a unique state of tune. Engaging Dynamic Mode delivers enhanced body control through firmer damping rates, increased steering weighting, faster gear changes and sharper throttle response. Dynamic Mode is configurable as standard via the central 8-inch touchscreen, allowing the driver to select and save settings according to their preference. Torque Vectoring by Braking (TVbB), which intelligently and rapidly applies precise amounts of braking force to individual wheels to accurately sharpen the car’s line through a corner, is standard. TVbB works in conjunction with the Electronic Active Differential (which can go from open to full locking torque in 200 milliseconds) and the car’s Dynamic Stability Control system to optimise traction, cornering ability and, most importantly, to maximise steering feel and agility. 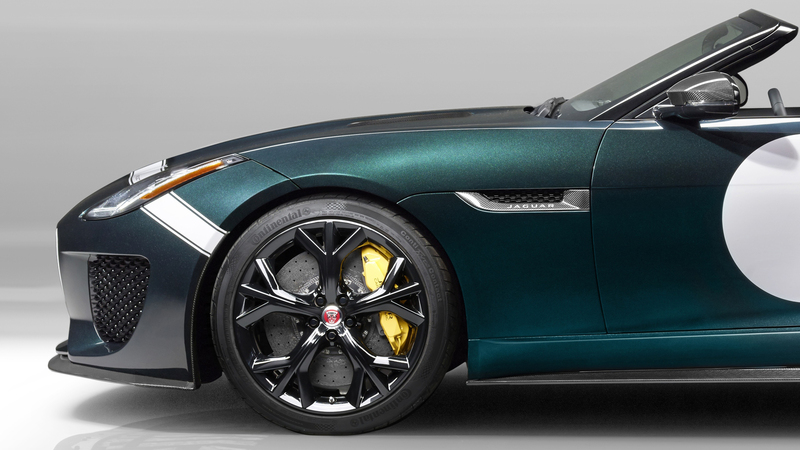 The Jaguar F-TYPE Project 7 retains the distinctive, minimalist design of the original 2013 concept. That design study was penned as a spare-time experiment that blended Jaguar’s rich racing heritage with its then-new, groundbreaking sports car line, the F-TYPE. Under Jaguar Director of Design, Ian Callum, the sketch – of a single-seater sports car with a swooping profile, muscular stance and cut-down windscreen – went from paper to digital model to the Goodwood hillclimb in the space of just a few months, and has now become a production car. “F-TYPE Project 7 is the perfect example of how, as a design team, we can move quickly with our engineering colleagues to go from concept vehicle to production reality – we’ve pushed the boundaries of what’s possible without losing any purity of form. F-TYPE Project 7’s key ‘heartlines’ remain those of the World Car Design Award-winning F-TYPE sports car. They effortlessly blend with the D-type-inspired rear fairing section that incorporates a rollover hoop and swoops rearwards and down from behind the driver’s head. 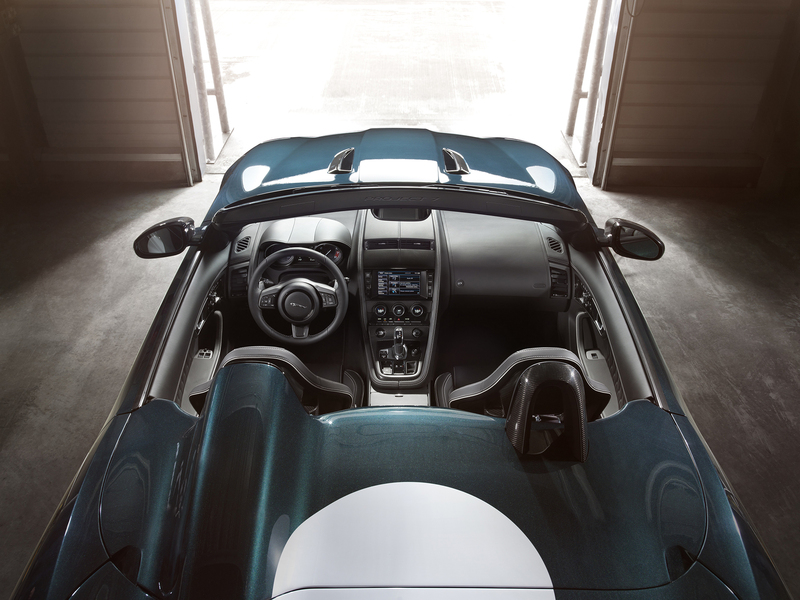 Being a two-seater, F-TYPE Project 7 features a second rollover hoop, behind the passenger seat. Extensive aerodynamic modifications on F-TYPE Project 7 include a front splitter with a lower section made of moulded plastic and an upper section in carbon-fibre. Side skirts, rear diffuser and an adjustable rear spoiler are all made of carbon-fibre. These components together mean the F-TYPE Project 7 generates 177% more downforce than F-TYPE Convertible at its top speed of 186mph. The rear deck, bonnet vents, side vent louvres and mirror caps are also all made of carbon-fibre. The windscreen length is reduced by 114mm, reducing overall height by 30.5mm, with new side windows to match the profile. 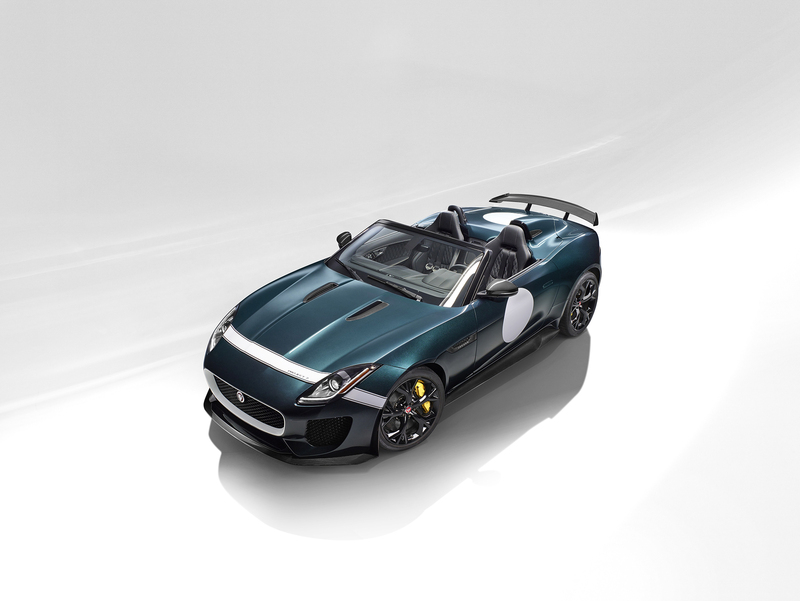 A Bimini roof has been specially designed for F-TYPE Project 7. It clips on to the convertible header rail, and can be conveniently folded and, when not in use, stowed in the boot area – which offers 196-litres of load space. The driver and passenger of F-TYPE Project 7 sit in lightweight race-inspired bucket seats, which are finished in a quilted racing-style diamond pattern. Four-point racing harnesses are available as an accessory. The interior features carbon-fibre veneer inserts on the console, an Alcantara steering wheel (with leather option), machined aluminium gearshift paddles and bespoke treadplates with the Project 7 logo. Enhancing its unique appeal, the 2014 F-TYPE Project 7 will be hand-built to exacting standards by Special Operations, and offered in an exclusive, limited-edition production run of up to 250 units globally. Each car will sport a specially numbered plaque, located between the two seats, signed by Ian Callum. 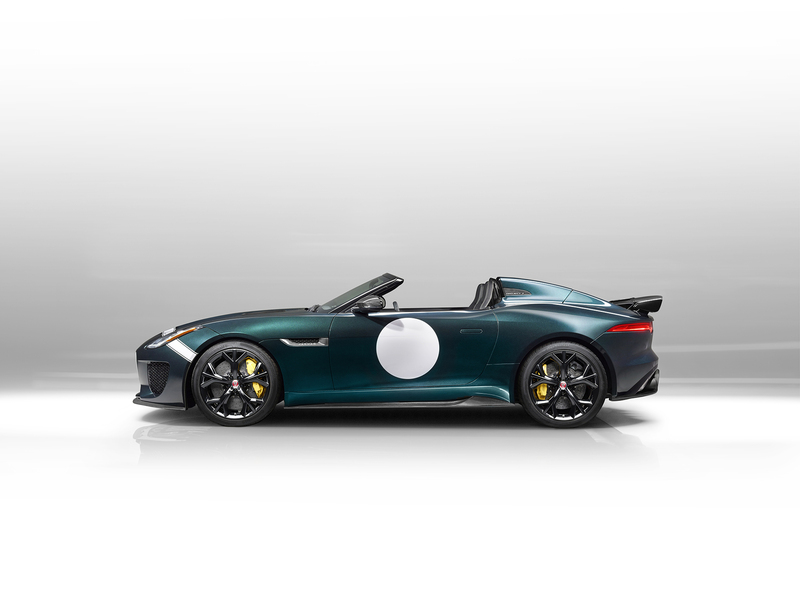 F-TYPE Project 7, whose name acknowledges Jaguar’s seven historic Le Mans race wins, will be offered in five metallic colours: Ultra Blue, Italian Racing Red, British Racing Green (all with white decal options), Ultimate Black and a new colour, Glacier White (both with grey decal options). Concept-site & superblog driving by Ewen @nomadelj +25 years of passion car enthusiast. 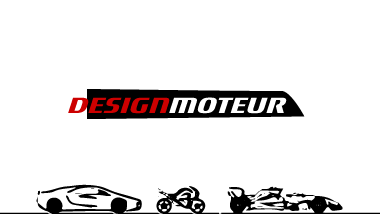 Automotive news and supercars posts about engine, exterior design and interior design.